What is the Recommended Distance Between a Kitchen Counter & a Kitchen Island? One of the essential considerations in planning a kitchen is the proper spacing of things. It's important to have sufficient walking and workspace between a kitchen island and the counters. Guidelines developed by the National Kitchen and Bath Association offer a solution to this dilemma. A properly placed island improves workflow in the kitchen. At least 36 inches should be provided for walkways between an island and counter. If the counter space contains a work area and appliances such as a sink, stove or dishwasher, the work aisle should be 42 to 48 inches wide. If one side of the island is used as an eating counter, there should be 36 to 44 inches of space to allow for the seating plus walkway. Kitchens used by a solitary cook often function well with tighter spacing, while larger families or multiple cooks may need wider, 48-inch work aisles. Size and layout are other considerations. 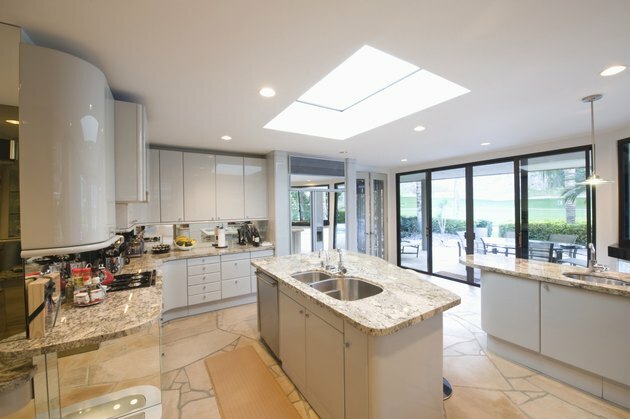 Galley kitchens may be so narrow that subtracting the walkway and work aisle distances from the floor space would leave 6 to 12 inches for an island, which is too small to be practical. For this reason, islands typically work best in L-shaped or U-shape kitchens. How Much Counter Overhang for Seating?